Earlier this year, Chinese Hip Hop music experienced an unexpected downturn after critics accused the genre of promoting misogyny and drug use. Now it looks like the genre might finally be making an official comeback as popular music competition show The Rap of China begins its second season on Chinese streaming giant iQiyi this weekend with a new focus on positivity. Unlike earlier this year when rappers - even those who shot to fame overnight via the first season of the show last year - were kicked off and even edited out of some Chinese variety shows and their works were removed from music platforms, in May the producers of the show were busy promoting its rappers, holding auditions nationwide and even extending opportunities to rappers in North America, provided they could rap in Chinese. "The new season of The Rap of China will be younger, more Chinese-style, more diverse, more positive and more trendy," concluded iQiyi CEO Gong Yu at the show's launch ceremony in Beijing on July 3. While its English title remains unchanged, the second season of the iQiyi show is scheduled to debut on the streaming platform this Saturday under a new Chinese name: Zhongguo Xin Shuochang (lit. China New Rap), instead of the first season's Zhongguo You Xiha (lit. China Has Hip Hop). But the new show's competition rules, stage setting as well as members of the judges panel, or "celebrity producers" as they are called on the show, remain nearly identical to the first season. According to the show's producers, the name change was to emphasize the show's new direction instead of, as many netizens have speculated, an attempt to avoid censorship. "We believe 'China Has Hip Hop' accomplished its historical task by introducing hip hop music to the Chinese public. 'China New Rap' is going to be a whole new show in which we will continue to explore what responsibilities rappers should shoulder after they make their public debut," Rap of China producer Chen Wei told media during an interview. Starting from the show's first round of auditions, the team this year focused more time and effort into examining candidates' history and "unhealthy habits," according to an article from Chinese music industry news site China Music Business - probably to prevent the entry of yet another PG One, the champion of the show's first season whose songs were removed from Chinese streaming platforms in January after netizens accused him of insulting women and promoting drug use with his hip hop song "Christmas Eve." In May, the show released a 28-second promotional video that features Chinese singer/actor and returning first season judge Kris Wu stating that the show will "demonstrate positive energy and lofty emotions through rapping" - also one of the show's new slogans that have frequently appeared in advertising campaigns. 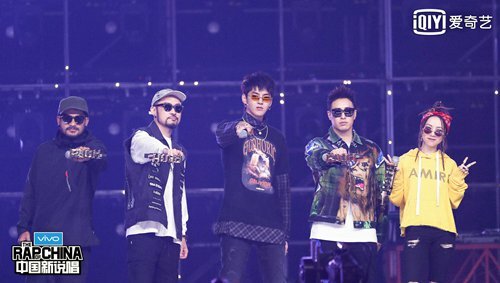 "We will also introduce a lot of Chinese elements in rap music, which will hopefully give audiences a fresh impression of our show," Rap of China director Che Che said at the launch. Positive about the future of the Chinese hip hop music market, both Chen and Che mentioned that the market is returning to a more rational state after the huge explosion it experienced last year. "Thanks to the first season of the show, many rap terms are no longer foreign concepts to many Chinese viewers, but the popularity that the show brought [to the genre] was somewhat overrated," Chen said. "With the market becoming more and more rational, we as a public platform should convey a more responsible attitude via the show by portraying hip hop culture not as just the latest trendy thing, but also as a quality product that has positive values," the producer said. To better convey this idea, the show will launch a series of new derivative products including a tie-in music festival. Aside from making rap culture a business, Chen said they're also planning to promote the culture as a new lifestyle via The Rap of China. "Young audiences will get a sense of a new lifestyle and attitude while watching the show. Most likely they will share and discuss this attitude with their peers; they might even go on to adopt this attitude or lifestyle if they feel that it makes them feel special and happy," Chen noted. Che also recalled how young fans shouted out the names of the student rappers and celebrated their music during the show's auditions held at universities and colleges at home and abroad this year, saying that he was impressed by these college rappers' enormous popularity among their peers. "I think that's because hip hop music really clicks with the aesthetic and values of young Chinese today," Che said. "Honestly, I felt this was becoming a trend back in 2015 when I was directing Heroes of Remix [a 2016 Chinese electronic dance music show]," he noted.